Why isn't ProjectName-Prefix.pch created automatically in Xcode 6? 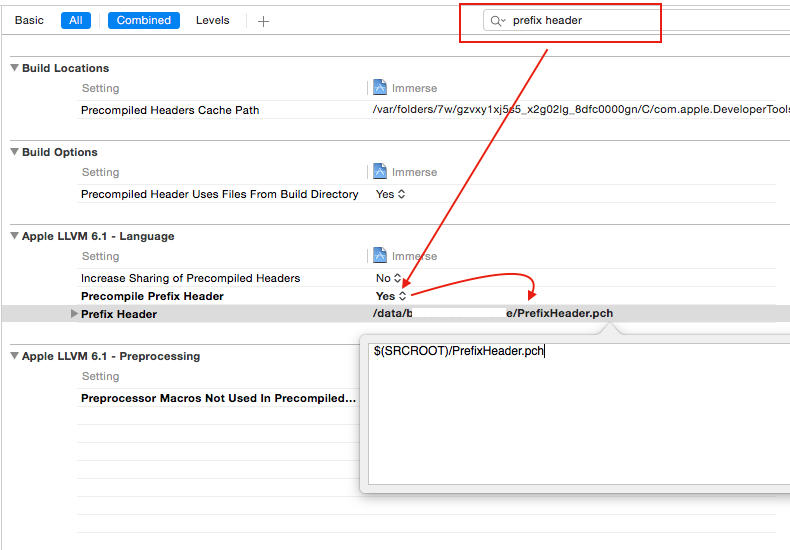 Why isn't ProjectName-Prefix.pch created automatically in Xcode 6 ? Is the precompile header no longer needed ? Where should I write the code that was in ProjectName-Prefix.pch before ? I suspect because of modules, which remove the need for the #import <Cocoa/Cocoa.h>. As to where to put code that you would put in a prefix header, there is no code you should put in a prefix header. Put your imports into the files that need them. Put your definitions into their own files. Put your macros...nowhere. Stop writing macros unless there is no other way (such as when you need __FILE__). If you do need macros, put them in a header and include it. The prefix header was necessary for things that are huge and used by nearly everything in the whole system (like Foundation.h). If you have something that huge and ubiquitous, you should rethink your architecture. Prefix headers make code reuse hard, and introduce subtle build problems if any of the files listed can change. Avoid them until you have a serious build time problem that you can demonstrate is dramatically improved with a prefix header. In that case you can create one and pass it into clang, but it's incredibly rare that it's a good idea. EDIT: To your specific question about a HUD you use in all your view controllers, yes, you should absolutely import it into every view controller that actually uses it. This makes the dependencies clear. When you reuse your view controller in a new project (which is common if you build your controllers well), you will immediately know what it requires. This is especially important for categories, which can make code very hard to reuse if they're implicit. The PCH file isn't there to get rid of listing dependencies. You should still import UIKit.h or Foundation.h as needed, as the Xcode templates do. The reason for the PCH is to improve build times when dealing with really massive headers (like in UIKit). Add new PCH file to the project: New file > Other > PCH file. At the Target's Build Settings option, set the value of Prefix Header to your PCH file name, with the project name as prefix (i.e. for project named TestProject and PCH file named MyPrefixHeaderFile, add the value TestProject/MyPrefixHeaderFile.pch to the plist). TIP: You can use things like $(SRCROOT) or $(PROJECT_DIR) to get to the path of where you put the .pch in the project. At the Target's Build Settings option, set the value of Precompile Prefix Header to YES. I'll show you with a pic! 2) Goto your project's build setting. 3) Search "prefix header". You can find that under Apple LLVM. 5) Clean and build the project. That's it!!! Not the answer you're looking for? Browse other questions tagged ios xcode xcode6 or ask your own question. Why .pch file not available in swift? Where is Xcode's build folder? Is it possible to install iOS 6 SDK on Xcode 5? Do I need to check in *Prefix.pch to source control system?